10 Words or Less: Aliens get Hollywood agent for first contact. Funny. Cover Blurbage: The space-faring Yherajk people have come to Earth to meet us and to begin humanity's first interstellar friendship. There's just one problem: They're hideously ugly and they smell like rotting fish. Gaining humanity's trust isn't easy when you look like a B-movie terror. The Yherajk need someone who can help them close the deal. Thomas Stein knows all about closing deals -- he's one of Hollywood's hottest young agents ,who’s just closed the biggest deal of his career. But it's one thing to sell your client when she's a hot young starlet. It's another thing entirely when your client is an entire alien species, depending on you to pull off the greatest introduction in this history of man. Stein's going to need all his smarts, all his skills, and all his wits to earn his percentage -- and his place in history. 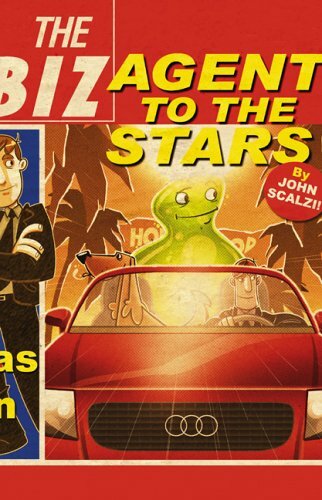 Agent to the Stars is a gleeful mash-up of science fiction and Hollywood satire from acclaimed novelist John Scalzi (Old Man's War), a film critic since 1991 and author of The Rough Guide to Sci-Fi Movies. It's a whole new look at alien encounters -- and a view of Tinseltown you've never seen before. Personal Notes: This was the very first novel I wrote, which I wrote more or less to see if I could write a novel. It appears so. This edition of the book is a special limited signed collector's edition, designed for the folks who sampled the novel online and decided they wanted to have it in genuine book form. The novel is still available to read online for free. Another reason to get this: The cover is by Mike Krahulik (of Penny Arcade) and it's the first book cover he's done for anyone else.